Some casinos in Las Vegas have a bad beat jackpot which pays silly money whenever two massive hands appear at the same time. To win the jackpot, the losing hand usually has to be quads or better. It’s pretty rare, as you can imagine. When any four of a kind can be beat, the odds of this happening on any given hand are in the region of 92,000-1 and it’s much more difficult if only certain hands qualify. That’s also assuming nobody ever folds a pair or suited connectors in a ten-handed game while they still have a chance to make something huge. 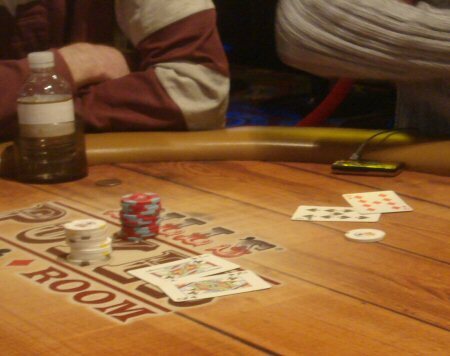 Not everyone folds a pair of 6s on a high, suited flop but it does happen. A week ago the jackpot at The Orleans got so large that it could be won by any aces full hand losing to quads (the odds of this are more like 2,000-1) and the room went crazy trying to hit it. Poker Grump wrote a great account of all the madness here. There are also casinos that don’t have a jackpot. Like Bill’s Gamblin’ Hall. I’d completely forgotten they even had poker when I passed through, but there was a no-limit game running right by the door. I’d already tried Imperial Palace and Flamingo and neither had a no-limit game running so I sat down before I’d even realised that this was the smallest game in town. There’s one $1 blind, and that’s it. You can buy in for as little as $20 if you like and you get $2/hr comps – almost as much as you’ll pay in blinds! I know they sell hot dogs in the sports book, but beyond that don’t ask me what you can spend the comp on. The game was only running 6-handed but soon after I sat down there was a massive pot, which must have surpassed the $100 mark, after JcQc flopped a straight with Td 9h Kc - only for 9s 9d to come back to take the lead when Tc paired the board on the turn. Straight flush wins. Quads loses. Well to be fair, they actually paid a $50 bonus for the quads, which just about covered his loss on the hand. The straight flush received a $250 bonus. But anywhere with a BBJ this would be worth considerably more. 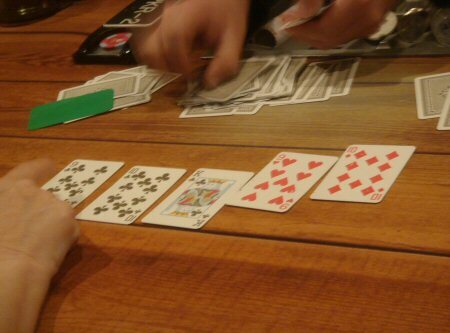 Usually the jackpot is divided up with about half of it to the loser of the hand, a smaller chunk to the winner and the rest distributed to everyone else playing in the room at the time. And with just 6 of us at Bill’s, I would have done pretty well out of that!